As the MWC 2018 is nearing, we are getting more and more details related to the phones that are expected to launch at the event. The Moto G6 series is also among the phones launching at the Mobile World Congress. Interestingly, we got a huge leak revealing all the 2018’s Motorola phones in January, and there have been a lot of other leaks in past few weeks that confirm the design and specs. 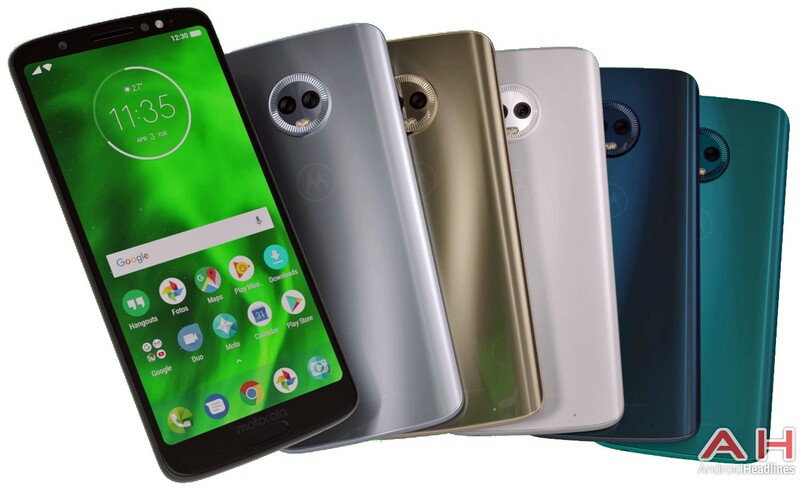 Today, another press image of the Moto G6 Plus has surfaced, and the image shows the phone in all the colors. In case you don’t know, the phone is expected to arrive in various color options. So yes, Motorola is going all glass and metal this year with its G-series, just as we saw last year with the Moto X4. The phone has glass on the rear as well as on the front, along with the metal frame. For the very first time, we are getting an 18:9 display. The location of the fingerprint scanner could’ve been much better, but for some reasons, Motorola opted for an oddly designed fingerprint scanner on the front. It is more interesting to see the Moto G6 Play having the same design but a rear-facing fingerprint scanner! The camera module on the rear looks familiar, right? Well, the design is very much same as the camera module on Moto X4, and we are going to see this design for all the Moto G series phones of this year. The Moto G6 Plus, as reported before, the color options include Gold, Deep Indigo, Nimbus, Dark Lake (Dark Teal), etc. As per the specs, sources suggest Snapdragon 630 processor, 18:9 display Full-HD+ display, 3,250mAh battery, Android Oreo and Dual cameras. The launch is expected to happen at the MWC as 2017’s Moto G phones were launched at the same event last year.